Search Engines AND Visitors Love! 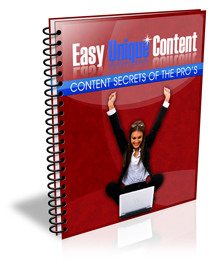 Easy Unique Content is available, plus receive Lynn Terry's TOP content tips & free resources! Not Everyone is a Natural Born Writer, or an Idea Machine... I've been accused of both! But the truth is I use very simple strategies and many free resources to come up with endless hot content ideas and topic-starters. I decided to sit down and write Easy Unique Content, to give you the same advantages that I enjoy in my own online business. These ideas will be invaluable to you if you blog, do guest blogging, create content for your website(s), have a mailing list, or use Social Media in your online business. If you would like to be the first to know when Easy Unique Content is ready to download, simply type in your preferred contact info using the form above. You will receive notification by email, with details about the Easy Unique Content guide and the Affiliate Program. Scroll up to request notification. Once you confirm your request, you're welcome to email me by hitting reply (yes, I check my own email). Feel free to send me your content questions!